Vol Kevin Neville Kevin Neville (1921-1964) was an accomplished IRA volunteer, POW, RAF member during World War 2, and O/c of Saor Uladh's southern units, before meeting an untimely death at the age of 43. The following are 1- a statement by the Irish Revolutionary Forces. 2- Funeral oration by Saor Uladh Leader Frank Morris. 3- His grave in Inniscarra, Cork. A great many thanks to Jim Lane for providing the above, and Phil at theirishrevolution for putting them out there. Regarding his joining the RAF, Lane writes in his "Notes on Republicanism and Socialism in Cork": "Gerry Higgins told me that, following the invasion of the Soviet Union in June 1941, Kevin Neville heeded the advice of leading socialist figures and sought and received parole from the Curragh Camp, going on to join the RAF. 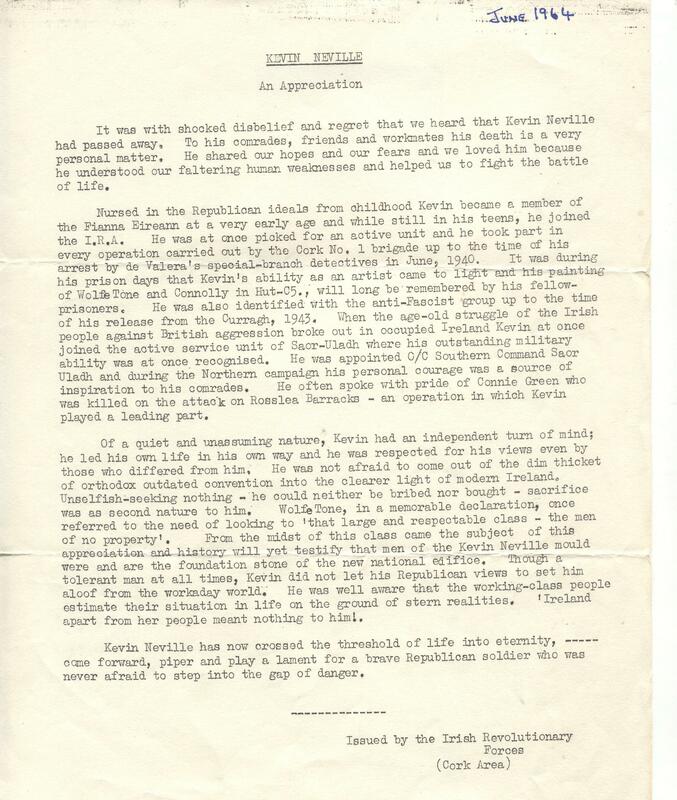 The advice given at the time was that all able bodied socialists should join the armies of the Allied forces in the fight against fascism and in defence of the Soviet Union. Later, when back in Cork, he found there was no welcome for him in the ranks of the IRA." Later in "Notes" he tells of how when the IRF faced similar ostracization from the Republican Leadership, which went so far as to seize the stencils for their newspaper and intimidate their supporters, Kevin Neville assisted them in a series of raids and confrontations which made clear to the leadership (in a bloodless manner) bullying would not be tolerated. 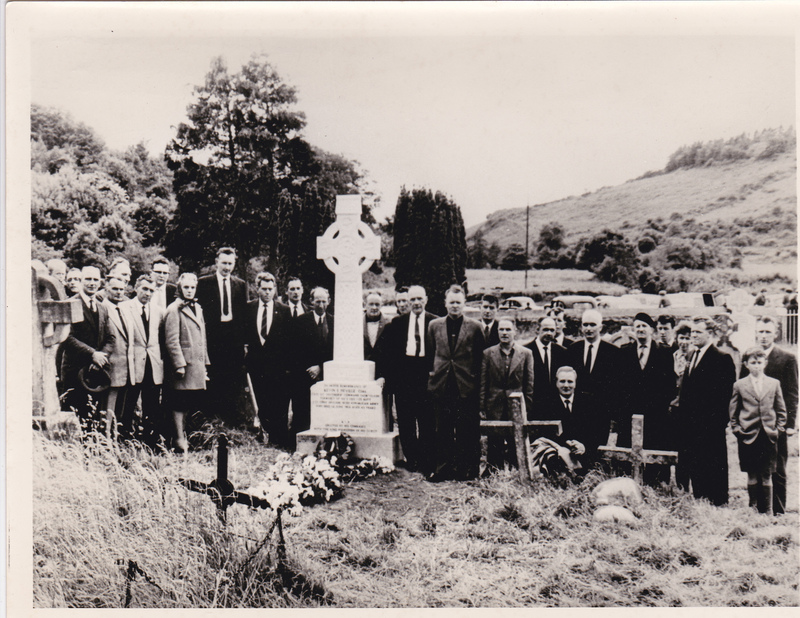 After his death on June 16th 1964, independent Cork republicans formed the "Kevin Neville Commemorative Committee" to construct a fitting monument over his grave and had it erected less than a year later (as seen in the last photo)*. 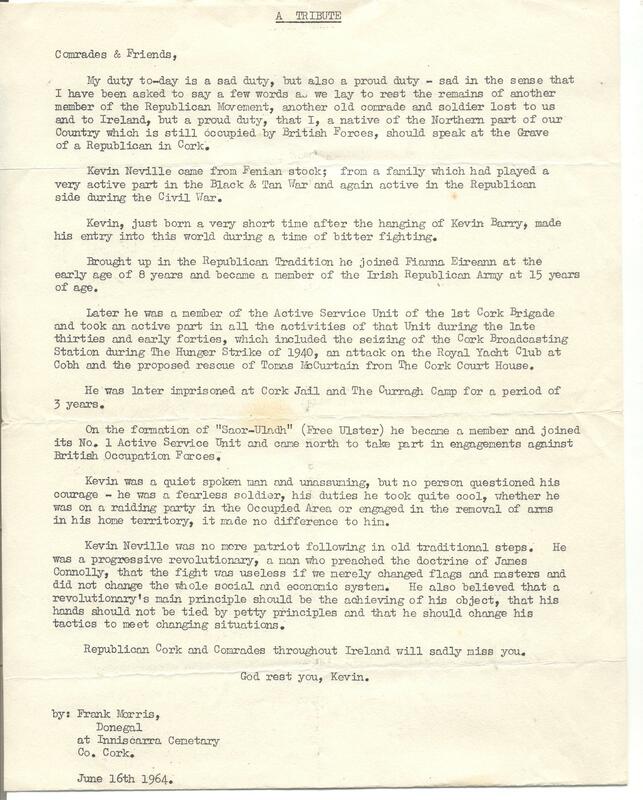 While he does not appear on any roll of honor, Kevin Neville gave his life to the dynamic struggle of freeing the North from British occupation and all Ireland from economic enslavement- a struggle which remains to be fulfilled. *- The committee reflected the broad range of friends he had; it was initiated by IRF members, chaired by Socialist Party member Maura Sheeehan, and Spanish Civil War vets Mick O'Riordan and Jim O'Regan were both considered for the oration. Your blog on Republicanism in the 1950s is very interesting and a great history of the time.